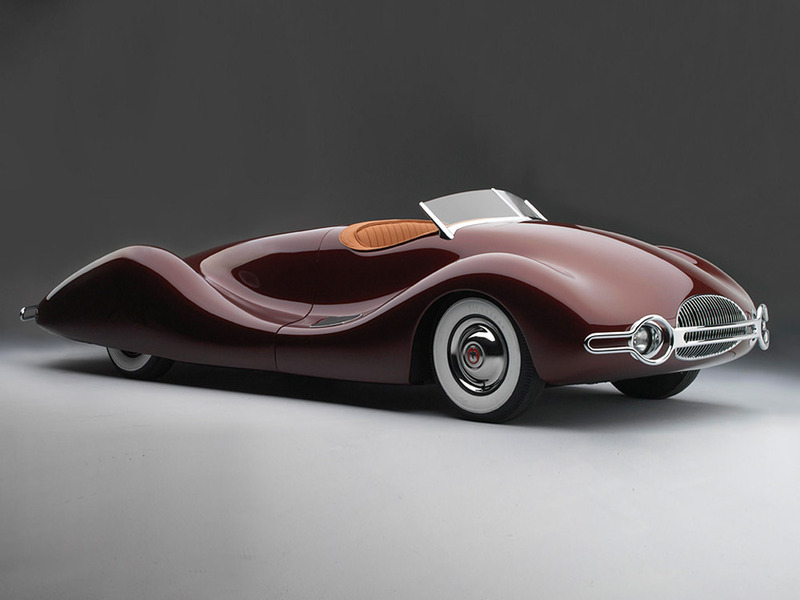 Mechanical engineer Norman E. Timbs created this dramatic streamliner in the 1940s. He designed the project himself which included a custom aluminum body and steel chassis. It took him over two years to finish the streamliner which in many ways was the ultimate American hot rod. Leading up to the design of this car, Norman E. Timbs had worked as an Indy 500 designer on cars such as the Blue Crown Specials which won Indy several times. Mr Timbs was no doubt influenced by the 1937 Auto Union Typ C Stromlinie and 1937 Mercedes-Benz W25 Avus Stromlinie which ran the 1937 Avus GP. His sensational shape was a very close approximation to these cars which ran the fastest GP race of all time nearing speeds of 248.40 mph (400 kph). Unlike the Grand Prix German cars, the Mr Timbs’ Streamliner was built for the road. It used a 1948 Buick V8 to power the 2200 lbs car to 120 mph. The engine was mounted in a custom chassis that placed it behind the driver. The main chassis is built up from four-inch steel tubes which kick up over the rear axle. The body is nod to the German GP cars which at the time mimicked aeronautical practice. The smooth shape is long and low with a complete underbelly panel. With the engine occupying the rear of the chassis, the cockpit is pushed forward. In keeping with the aerofoil shape, no doors were are cut out of the body. A large one-piece rear panel opens hydraulically to reveal the entire rear end of the chassis. Road & Track reported that it took Mr Timbs 2 1/2 years to create the car at a cost of $10,000 USD. The body was created entirely in aluminum by Emil Diedt for $8,000 alone. At first the Streamliner was only used on the show circuit until Jim Davis of California bought it in 1952. He used it in and around Manhattan Beach, California and let Motor Life photograph it for a feature article. The car was discovered in the desert pretty much intact in 2002. It was restored by Dave Crouse for the 2010 Amelia Island Concours d’Elegance.